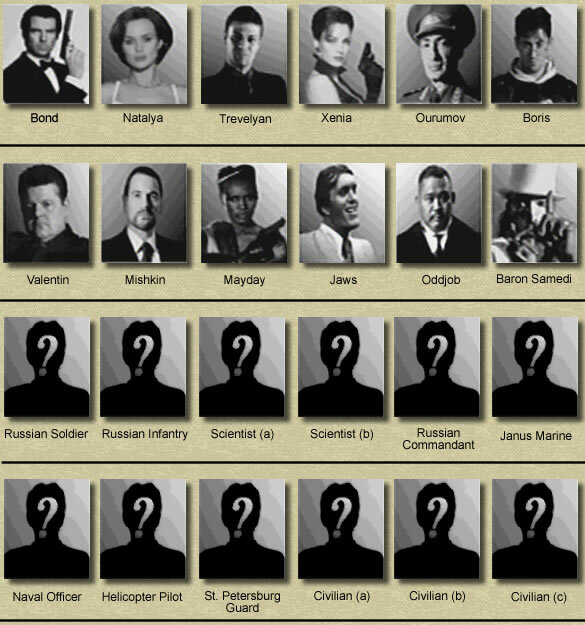 GoldenEye multiplayer characters including Gameshark codes only characters! Check out the CHARACTER HEIGHT EXPERIMENT page that shows screenshots of the various characters. You might be surprised to see the results. You might find the answer as to why you've been losing so much over the years!! 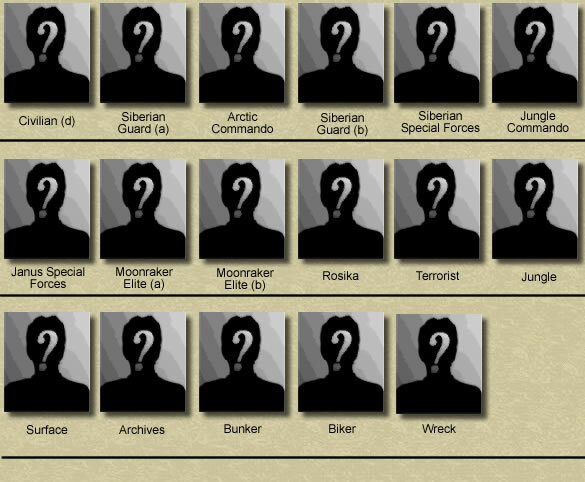 The characters show below are listed in the exact order that you will find them in the game menu. Just move from left to right down this page. They will open up a popup window so please make note of that if you use a popup stopper. Of course I've included some of the Gameshark characters that I created and the code can be found HERE. This code also gives you 4 Jaws and 4 Oddjob characters as well as 4 Russian Infantry, 4 Siberian Special Forces, 4 Janus Marine and 4 Naval Officer. Now you can all play with the best available characters for a given level. With regards to the Jungle, Archives, Bunker, and Surface characters, these are the suits that Bond wears. For good laughs check out the Surface and Biker!